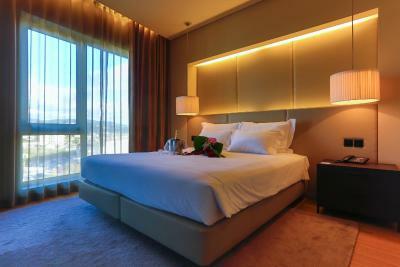 Lock in a great price for Golden Tulip São João da Madeira Hotel – rated 8.3 by recent guests! The breakfast was good. The staff was nice and polite. The rooms were clean. The hotel is nicely laid out. Decent size rooms. They now also have a good internet system and decent coffee in the breakfast room. The restaurant had lunch specials. The staff was very helpful and really went out of their way to accommodate my needs. The room was very clean, and the bed was super comfy. We really enjoyed the breakfast, as well as the meal at the restaurant. It was very well located - quite close to the city center, just a short walk away, and the staff were overall helpful and friendly. We just needed a simple stay for a friend's wedding, but it was far above what we needed, great value for money. Staff were fantastic and guy on reception was wonderful (apologies I cant remember his name) Spoke fluent English. The hotel was clean and well appointed staff were friendly and helpful, l pool was welcome on a hot day. Breakfast was of a good standard. 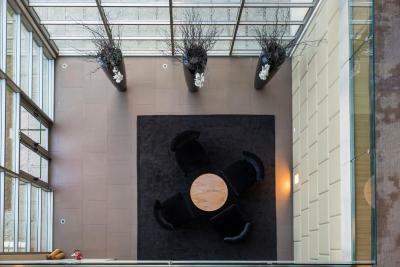 Golden Tulip São João da Madeira Hotel This rating is a reflection of how the property compares to the industry standard when it comes to price, facilities and services available. It's based on a self-evaluation by the property. Use this rating to help choose your stay! This modern 4-star hotel offers an indoor pool and air-conditioned rooms with flat-screen TVs. Golden Tulip São João da Madeira Hotel is located in the center of São João da Madeira, 26 mi from Francisco Sá Carneiro Airport. All rooms at Golden Tulip São João da Madeira Hotel feature satellite TV and mini-bars. Each is fitted with large windows and contemporary furniture. Free WiFi is also available. The Pais restaurant serves local and international dishes in a distinct ambiance. Cocktails and wine are available at the hotel’s bar. 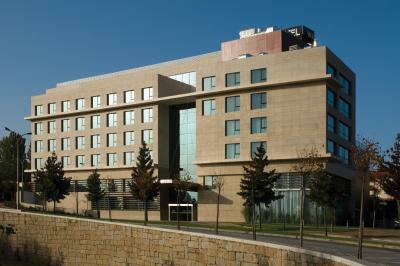 The Golden Tulip São João da Madeira Hotel is located 30 minutes’ drive from Porto. 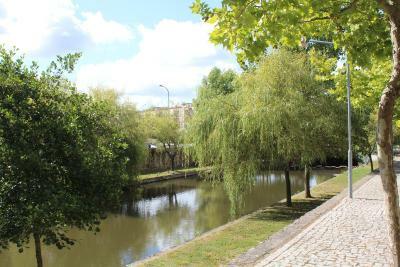 The beaches in Espinho and Furadouro are also a 30-minute drive away from the Golden Tulip São João da Madeira Hotel. 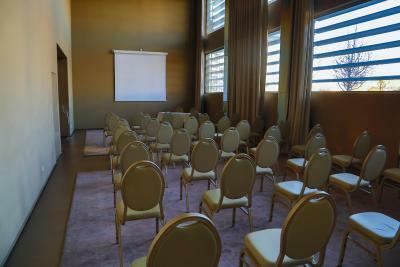 When would you like to stay at Golden Tulip São João da Madeira Hotel? 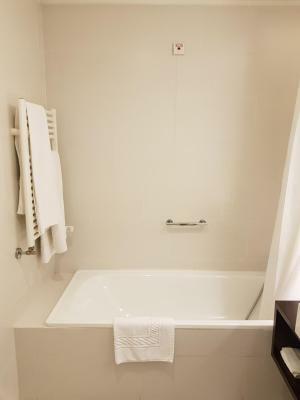 This ample suite comes with a private bathroom, safe and air conditioning. It has city and garden views. Its living area includes a sofa and a satellite TV. 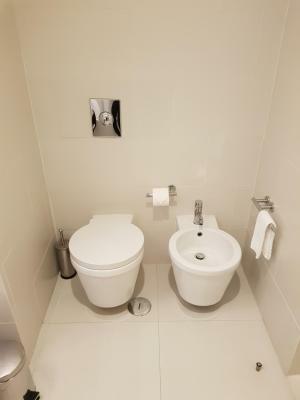 This double room comes with a private bathroom, safe and air conditioning. It has city and garden views, as well as a satellite TV. This twin room comes with a private bathroom, safe and air conditioning. It has city and garden views, as well as a satellite TV. House Rules Golden Tulip São João da Madeira Hotel takes special requests – add in the next step! Golden Tulip São João da Madeira Hotel accepts these cards and reserves the right to temporarily hold an amount prior to arrival. When booking more than 12 rooms, different policies and additional supplements may apply. The hotel will contact guests with further information. Room was too hot and I could not sleep. Air con does not work cool in winter apparently. Dog barking most of night just behind hotel. would have shot it if I had a gun !! Slight smell of bad drains in hotel. service from the staff was great. Toilet not clean . Strange smell inside the room. There was a persistent burnt smell on the room that got my allergies going and a sense of dust in the air.. Very nice breakfast, very nice facilities. The gym room is tiny and the change rooms by the pool are dark and not welcoming. if you improved with a larger gym and more lighting, i am sure more people would use it. The view. I thought it was going to be a pretty river view like the photos online but it was nothing special. If I'm being extra picky - there were no electrical sockets next to the bed, which meant keeping smartphones charging overnight next to the desk. But that's an insignificant detail in an otherwise great stay! Whilst the design of the hotel was lovely , it was a little disconcerting as the glass panels on each landing were quite low and I was a little nervous with kids etc. Undoubtedly very safe but the possible danger element did cross my mind. The wifi signal didn't reached one of our rooms. The toilet shape was round it wasn't comfortable. We stayed on the 7th floor and the weather was hot. The air conditioning had failed but staff did their best to have it repaired and were very apologetic.